[Press release] The Department of Fisheries and Just Us Kids carnival band has collaborated to host an Educational Fun Fair and Line Jam Jump up on Saturday July 7th, 2018. The event starts with the Fun Fair at 10am, on the Ave Maria School Grounds followed by the Line Jam Jump up at 2pm. 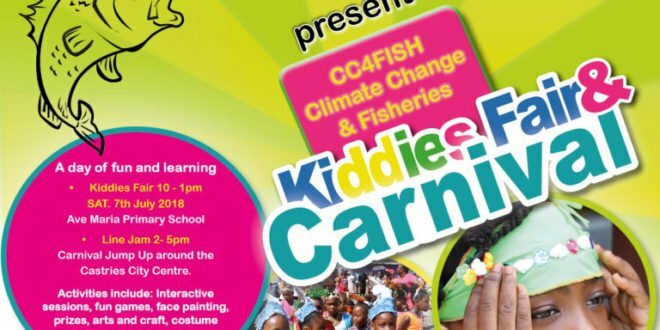 The event is support by the Climate Change Adaption in the Eastern Caribbean Fisheries project (CC4FISH) and will be produced under the theme “Youth in support of strengthening Fisheries against Climate Change”. Youth of all ages are encouraged to participate in this free event. The event is expected to engage participants in fun-filled interactive sessions, designing of head pieces, placards, games, prizes and lots of giveaways. Important messages on the marine environment and impact of climate change will be highlighted. All participants at the fair will receive a free T-shirt if they wish to register for the Line Jam jump up.